Retirement did not mean lack of activity or purpose to Miller. In addition to building up his property portfolio and sitting as a Liberal Member of Parliament (1868-74), he established a military volunteer corps, travelled widely and nurtured his religious, academic and aesthetic interests. Leisure time was there to be filled with instructive pursuits. He was devoted to his family and had worked hard to provide them with a high standard of living. Though he may have missed some of his five children's formative years while he was building railways all over Scotland, he did see their emergence into adulthood. When Miller retired in 1850 the family lived in Millfield House at Polmont in Stirlingshire. He had bought the estate in 1842 and had the mansion built to his own design. He would now devote a lot of time to improving it. The 1851 census shows it had a staff of nine, plus Miller's secretary Charles Ogilvy (b.1826). One of the staff was governess Elizabeth Donaldson, who taught the four younger children. Margaret, the eldest, was boarding at St Cuthbert's girls' school in Edinburgh. In 1852, he added a conservatory in the style of Crystal Palace (1851) to Millfield, and in around 1858 the house had gas lighting. Millfield would remain in the family until 1870. It was demolished in 1958. Miller also acquired the neighbouring estate of Parkhill and set about refurbishments. The estate included Parkhill House (built c.1790), which is still standing, though now divided into apartments. Also in 1852, he bought the 5,260ha Leithen Hopes estate at Innerleithen in Peebles-shire, for �,000, and extended its 16th century manor house to become Leithen Lodge. Then state-of-the-art home comforts included a hydro heating system. A new wing was added in 1885-8, designed by architect Sydney Mitchell (1856-1930) in Scottish Renaissance style. Leithen Hopes remained in the family until 1945. Miller bought the Drumlithie estate in Kinkardineshire in November 1853. Its 1,130ha and buildings cost around �,000, and he spent money on land reclamation, drainage and new buildings over the next two decades. That same year, Miller took the family on a European tour lasting six or seven months, visiting Switzerland, France and Italy, and possibly other countries. He enjoyed travel, at home and overseas, and had the means to do it in style. Religious faith was an integral part of Miller's character. He was a member of the Church of Scotland well into his forties and had made a substantial financial contribution to the building of a new parish church at Polmont (1844-5). He had been a member of the Polmont Parochial Board — parochial boards were responsible for poor relief before the parish council system was established. However, he had disagreed with church officials over the disposition of funds and other matters. In Edinburgh, his Melville Crescent house was close to St Andrew抯 Parish Church, the scene of the 1843 'disruption' that led to the formation of the Free Church of Scotland. Miller may have found this new movement more to his liking — when at Leithen Lodge, he attended Innerleithen Free Church. As he would remark in 1865, "If I regret anything in this world, it is that I was so long a member of the Established Church". He went on, "I do not find fault with the doctrines of the Established Church. I find fault with its government". In March 1857, together with his family, he cut his ties with the Church of Scotland and joined the congregation of Polmont Free Church (built 1847), where he became an elder in August 1859. Over the years he made many donations, including money for the bell that still hangs in the belfry. The church is south of Polmont Station (on the Edinburgh & Glasgow Railway) and is now known as Brightons Parish Church. Aside from religion, Miller was always keen to promote self-improvement through learning. In 1849 he had helped William Hepburn (1823-90), then gardener at Millfield, to set up the Polmont Mutual Improvement Association. Miller held the positions of vice-president and president, and gave talks on various subjects, including his travels. The association established an extensive free lending library. Hepburn was the librarian, and went on to become editor of the Falkirk Herald, followed by other editorial posts in Northumberland and London. Miller didn't neglect his own cultural development and began to study art. He amassed a significant collection of paintings, books and photographs. In 1856 he was one of the founder members of the Photographic Society of Scotland. Since around 1830, he had been friend and patron of the artist, lithographer and photography pioneer David Octavius Hill (1802-70). He owned many paintings by Hill, some of which he had commissioned, including views of structures on the Garnkirk & Glasgow Railway, the Edinburgh & Glasgow Railway and the Glasgow, Dumfries & Carlisle Railway. On 14th October 1858, Miller's daughter Margaret married engineer George Cunningham of Lilliesmuir, Perth, at Polmont Free Church. The couple lived at Parkhill House, where Miller's first grandchild Marjory was born on 11th August 1859. They would produce at least five more — John (b.1861), Isobel (1863), Mary (1865), George (1867) and Bertram (1871). When war with France seemed imminent in 1860, Miller helped establish the First City of Edinburgh Engineer Volunteer Corps. He was captain, and son-in-law George Cunningham was lieutenant. The corps merged with the First Lanark Engineer Volunteers in 1862 and Miller resigned, but Cunningham stayed on until the combined corps disbanded in 1865. Volunteer corps fêtes were held at Millfield in the September 1860 and 1861. In around 1864, Miller spent some months in Egypt and Palestine, resigning his duties at the Polmont Free Church on 7th December 1863 to do so. The unexpected death in 1864 of Miller's only son John dealt the whole family a devastating blow. It's possible Miller gained a small measure of consolation from the fact that his nephew John Miller, 13 years older than his son, not only carried on the name but became a railway engineer. Miller's daughters Jessie and Mary both married in 1874, the year that he left Parliament. Jessie married barrister John Webster (b.1839) of Inner Temple in London on 4th February. Youngest child Mary married farmer Alexander Thomson from Tillicoultry in Clackmananshire on 3rd June, and had at least one child, Claud Muirhead Thomson (b.1881). 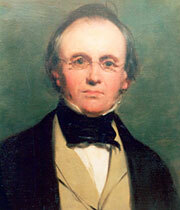 Both weddings were conducted by leading Free Church minister Dr Robert Buchanan (1802-75) in Miller's Edinburgh house. He settled �,000 on each daughter as a dowry. Isabella, after 41 years of marriage to Miller, died on 6th January 1876, aged 76. His second daughter, also Isabella, remained unmarried and lived with her father in Edinburgh, together with six servants. It was here that Miller died after a short illness on 8th May 1883, aged 77. His fortune, excluding his several properties, was recorded as �,476 — equivalent to about �930,000 (2010). All four surviving children had an equal share of the money, with the Leithen Hopes estate going to Margaret and George Cunningham. Cunningham would have a long career as a railway engineer and contractor, and to perpetuate the family name, after Miller's death he changed his surname to Miller-Cunningham. It became a tradition that when the Leithen estate was inherited by the eldest surviving Cunningham son, he would add Miller to the family surname. The last person to continue the Miller-Cunningham name would be Miller's grandson Sir George Miller-Cunningham (1867-1945). He had two children — George Denis Cunningham (1903-1976) and Grizel Margaret Miller-Cunningham (1910-43). However, the Miller lineage survives to this day. George Denis Cunningham produced one son, David Charles Cunningham (b.1940), and two daughters. David Charles has a son George Daniel Cunningham (b.1976) and a daughter Charlotte Duplay (née Cunningham, b.1978). Grizel Margaret Miller-Cunningham married James Roderick Sinclair (1906-65) in 1933 and changed her surname to Sinclair. Four years after her death, in 1947, James Roderick Sinclair became 19th Earl of Caithness when his paternal uncle died without a male heir.